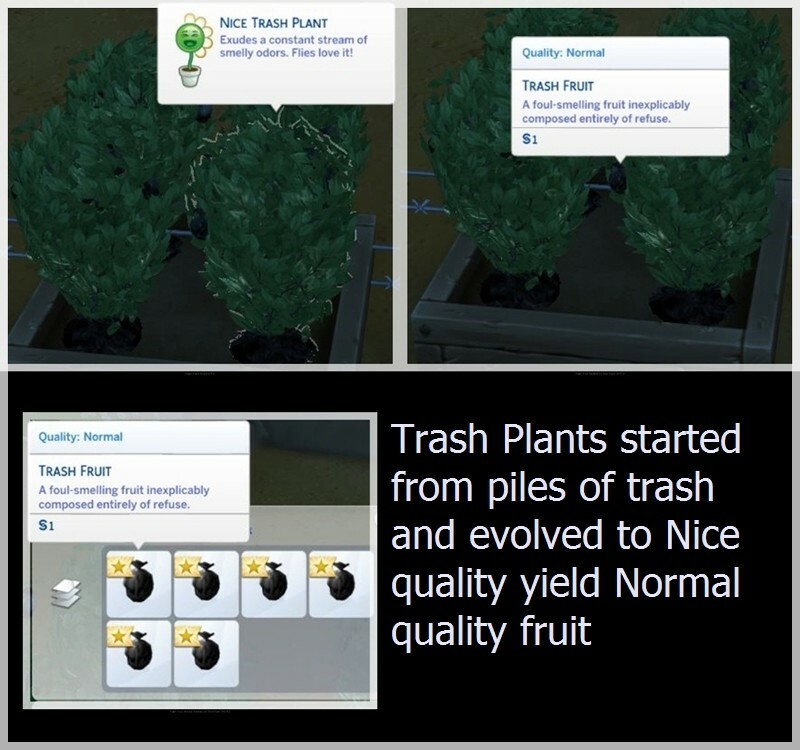 Trash Plants started from piles of trash and evolved to Nice quality yield Normal quality fruit. Moved The Sims folder and started a fresh game. Checked for updates and used Repair game option. Deleted all existing Trash Plants from lot. Started new trash piles to grow all new plants. Harvested all plants at Normal level and fertilized all plants. Evolved all plants to Nice quality. Harvested a single random Nice plant. Harvested fruit was only Normal quality. We've reproduced the plants spawned via festivals yielding 100% Normal quality harvestables, despite all the plants being Good or Great. I don't know. Trash is still trash, after all. But on the other hand, some types of trash can yield excellent things. One man's trash is another man's treasure kind of thing. Hmm, I will have to go back and check my plants fruit. So it's a bug, hmm. Thanks for looking into it! Your comment reminded me of the HGTV show called Trash to Treasure or the one called Flea Market Flip. *Has anyone here noticed a difference with other plants? This time I am seeing Garlic with Very Nice plant and a mix of normal and good Garlic harvested from the one plant. The Garlic was planted from seeds bought by clicking on a planter box. My Gardener is my own creation and at level 10 of the skill. I put the plant into family inventory and planted a new plant from the highest quality Garlic. Recently had to do a factory reset of my computer. 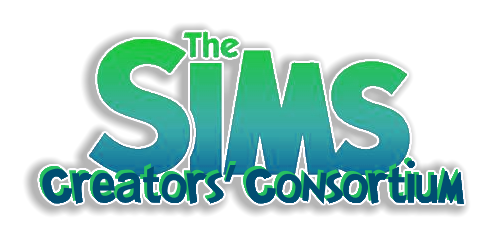 That means I am on Win7 with a fresh total install of Origin and all the Sims content. The plant's worth seem to be erratic. Fertilizing with a valuable plant doesn't seem to help the fertilized plant to increase in money value. There was a time when the stay-at-home parent could make good money with selling their garden harvest. My Sims used to get the occasional hundreds or even a thousand dollar fruit or vegetable. Now it seems to all be about bulk to get any money from sales. I had thought that maybe the plant value was based on the gardeners level but that would be too complicated. I have a few gardens that I know have produced the higher priced produce but the saves I've visited this past year seem to have devalued plants. Most of my saves have a garden but don't seem to grow the higher priced produce anymore. Previously I had been focusing on Trashplants because of the Murkland Challenge. With a total new install of the game I wanted to create a condensed version of a perfect or near perfect garden. I wanted to use evolved plants and grafting to have the most variety with the fewest plants. That was when I discovered the plant quality is still erratic. I now have two level 10 gardeners working in this project. The going us very slow and thus issue is making it frustrating. I do like to graft the plants to make less work for my Sims gardeners and that seems to bring their levels down and it is slow getting them going again to higher levels and money value. I still have one or two old saves that I know the gardeners are level 10 and plants are high level too with a very nice sell value. I will eventually play them again to see how their gardens grow. If the game has changed them or not. And to see if I still want to keep them 'saved' or let their game play go au natural. ...or let their game play go au natural. A trick to grafting is to take a cutting from the lower quality and graft to the higher. Example: Get a cutting from a Normal Lemon tree and graft it to a Perfect Apple tree. This is supposed to yield both as Perfect. Thinking about plans for any future Gardeners. Going to evolve and replace with the highest quality. Will evolve faster growing plants to use to graft new normal ones. That will result in compact gardens of higher levels. Once I have a higher level the normal ones will be sold and new evolved ones planted. Ahhhhh.........This is great information I never knew. Sounds like a plan for sure. A very ambitious plan. In that last Murkland challenge, What's Left of the Gym, Fern completed her ambition but I'm positive she never grafted a plant to revive it. Because one never died.